Positive Detroit: Come Celebrate '8 Weeks Under 8 Mile' Kick-Off This Saturday! Come Celebrate '8 Weeks Under 8 Mile' Kick-Off This Saturday! Kick off 8 Weeks Under 8 Mile by spending your day and your dollars in Southwest Detroit for Cinco De Mayo! Rise and shine. Start your morning off right with breakfast at Steak Hut (1551 W Lafayette Blvd) or Duly’s Place (5458 W Vernor Hwy). Running late? Pick up a breakfast burrito at Evie’s Tamales (3454 Bagley St) or Honey Bee Market (2443 Bagley Street) with a top notch coffee from Cafe Con Leche (4200 W Vernor Hwy). It’s game time. Next, join us as we kick off 8 Weeks Under 8 Mile, watching Detroit City FC kick off their inaugural season of minor league soccer with an 11am scrimmage versus the Latino All Stars at Historic Fort Wayne (6325 West Jefferson). Admission is free and is a great opportunity to support your new hometown team, check out the historic site, and cheer for Detroit’s youth in Think Detroit PAL’s weekly soccer games taking place on neighboring fields. Post-game. 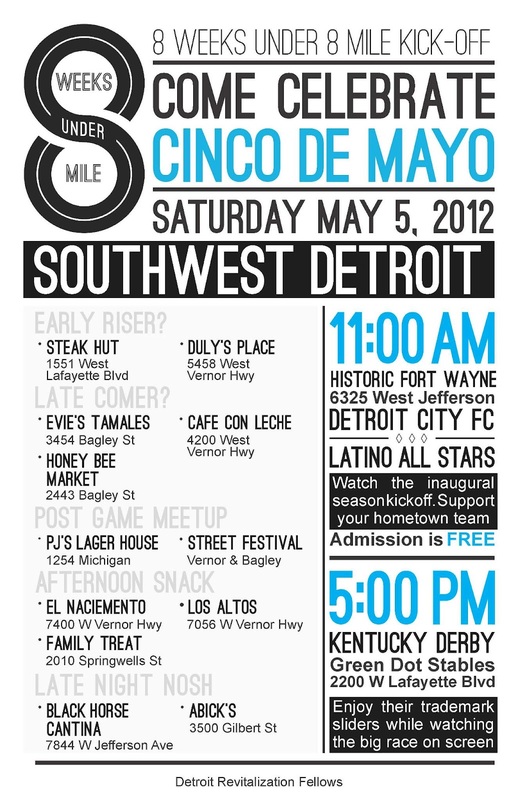 After the game, head to PJ’s Lager House (1254 Michigan Ave) to celebrate with the team and its supporters, or hit up the street-filling fiesta in Mexicantown (Vernor and Bagley) to soak in the Cinco De Mayo fun. Hungry? Escape the crowds and head west for a feast at El Naciemento (7400 W Vernor Hwy), Los Altos (7056 W Vernor Hwy), or Springwells’ famous Family Treat (2010 Springwells St) to name a few. Off to the races. For evening fun, don’t forget about the Kentucky Derby (coverage begins at 5pm). We’ll be at the equestrian-themed Green Dot Stables (2200 W Lafayette Blvd) eating up their trademark new sliders and the watching the big race on the big screens. After the race, keep your night (and neighborhood spending) going with stops at the Black Horse Cantina (7844 W Jefferson Ave) or Abick’s (3500 Gilbert St). 8 Weeks Under 8 Mile challenges you to do all of your shopping in Detroit for 8 weeks and share your experience online. The challenge kicks off Saturday, May 5 and ends with a bang on June 30.